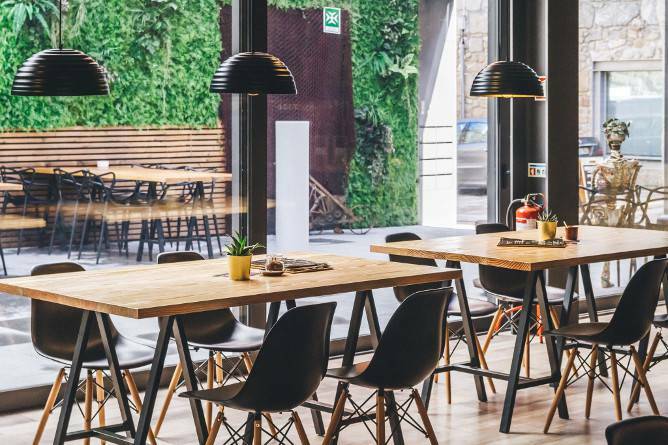 We’ve recently covered the best breakfast places in Porto, whereas for lunch you can pick and choose from any of our best restaurants in Porto. 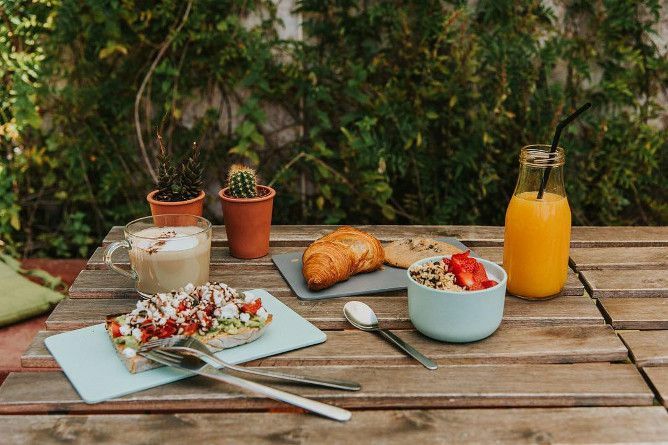 However, if you’re the less-is-more kind of person, the idea of killing two birds with a proverbial stone entices you, or simply can’t be bothered with waking up early, then you will like to know that we’ve gathered the 7 best places for brunch in Porto. Brace yourselves, pancakes are coming. Come right in, have a seat and take a look at the menu. Have a go between the coffee, toasts, pancakes, ice cream, pancakes, juices, pancakes, or even the pancakes. Some of you may have already deduced the specialty of “O Diplomata”. 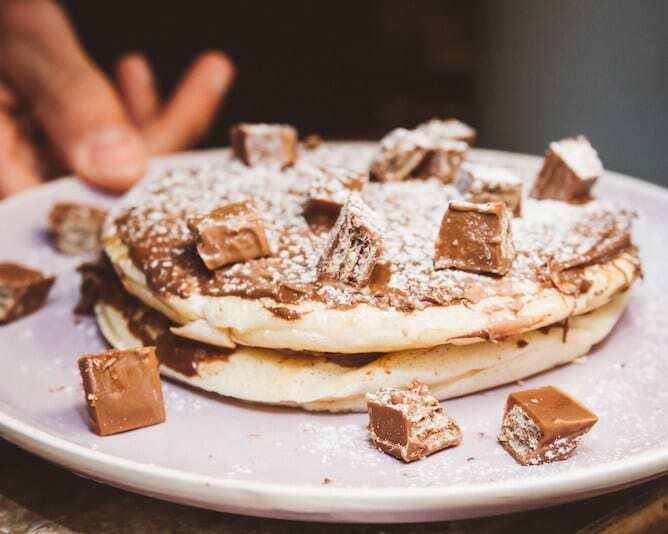 In all shapes and sizes, their pancakes come in virtually endless combinations depending on your choice of dough, topping, fruit, ice cream and “crunchy”. 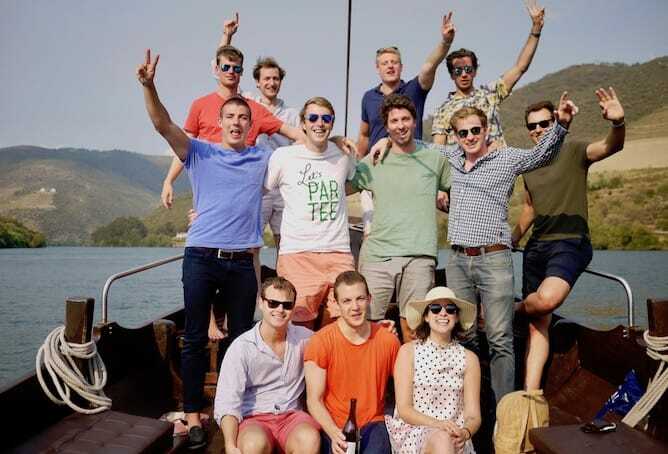 These diplomats take their brunch very seriously, so you don’t have to. 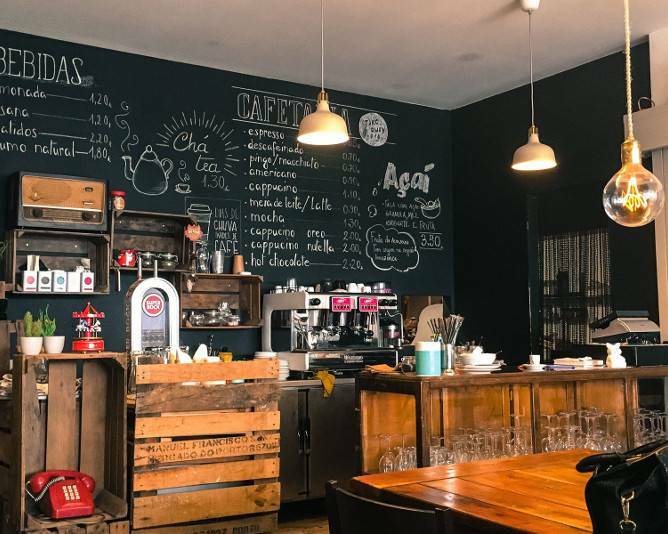 You can choose between several brunch menus that range from 6€ to 10€ – the last one includes two pancakes with honey and butter, bacon & eggs, an açai bowl, a warm drink and a cold one. You can choose to have extra toppings on your pancakes, for a low extra cost. How to get there: The train/metro station São Bento is a 9min walking distance. 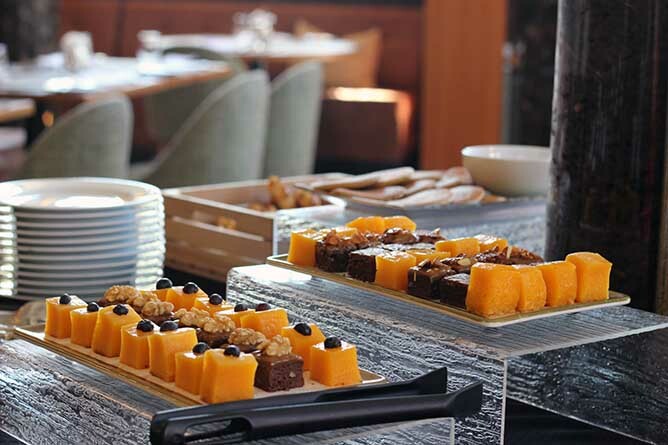 The buffet style brunch (€25) has many food options that the lovely staff is ready to help you choose from. It has salads, smoked meats, cheeses, wraps, pizza, smoked salmon and tiny veggie burgers (which are so delicious by the way!). We love the portion sizes as it allows you to try so many different foods without being too full too quickly. The hot dishes are served separately so they don’t get soggy and cold. They normally have three options, a vegetarian dish, a fish dish and a meat dish. 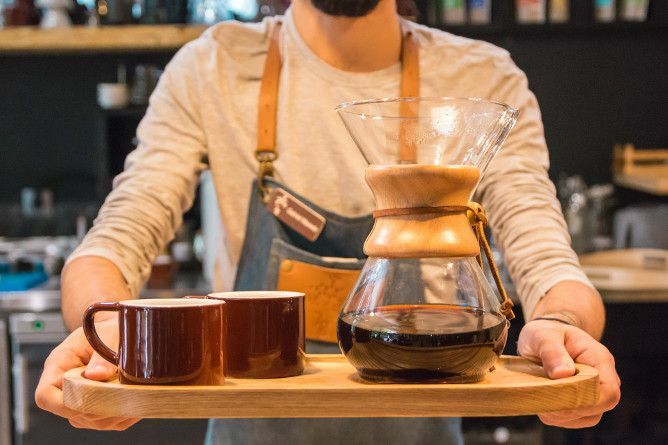 To drink, you have tea, coffee, fresh juices and more. We certainly enjoyed the cucumber lemonade and the Port Tonic cocktails. As for the dessert, you have mini pancakes made to perfection that you can dip in a chocolate-coffee spread, chocolate cake with nuts (crunchy and delicious), pudding and more. 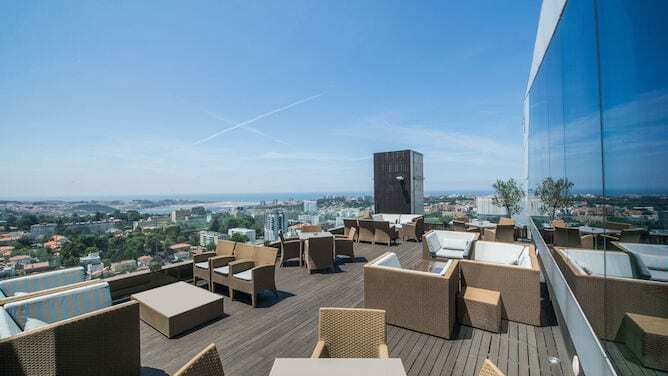 When you’re done with brunch, don’t forget that you can spend the afternoon on the hotel’s rooftop, one of the best rooftops in Porto. 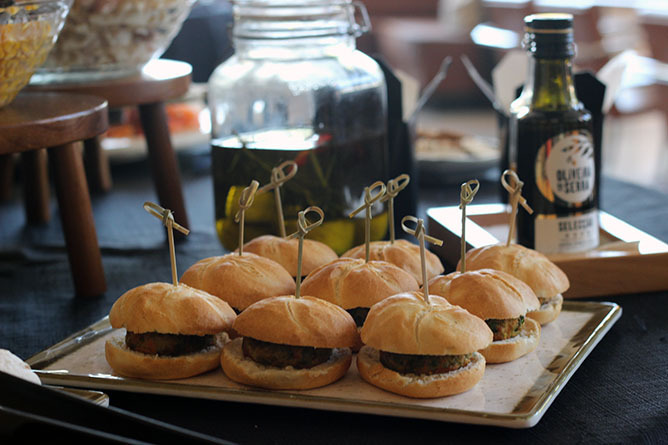 This brunch buffet at 33 Alameda is perfect for families, large groups or a friends’ hang out. 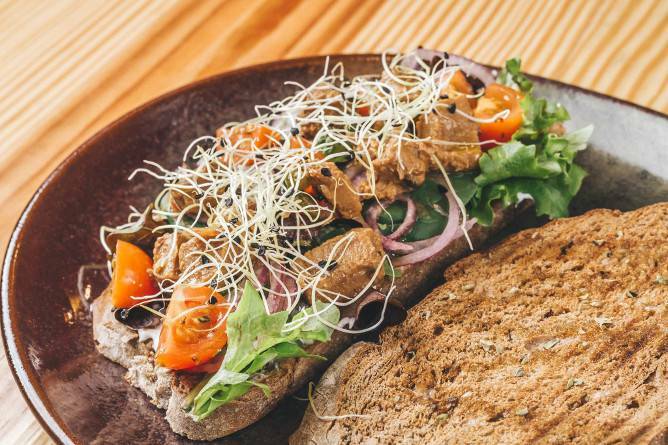 It’s also great for vegetarians because it offers many meatless options. How to get there: take the tram Line 1 until Museu C. Elétrico. The hotel is a 2min walking distance. When we think about having brunch in a calm weekend afternoon, Cais de Gaia (Gaia Pier) doesn’t come to mind — it’s like the apocalypse down there on the weekend as it is completely packed with tourists. 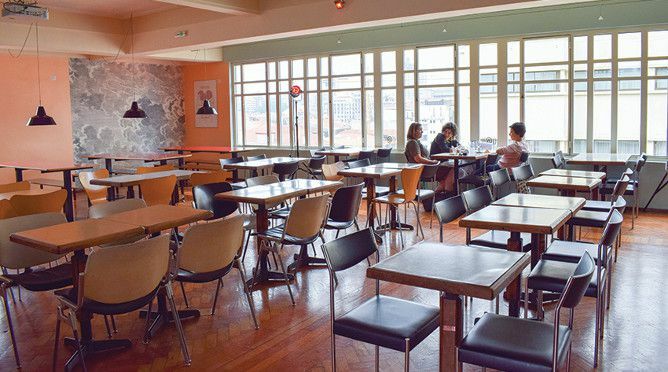 However, near Cais de Gaia, you’ll find 7g roaster, one of the best places to have brunch in Porto. They have two brunch options. 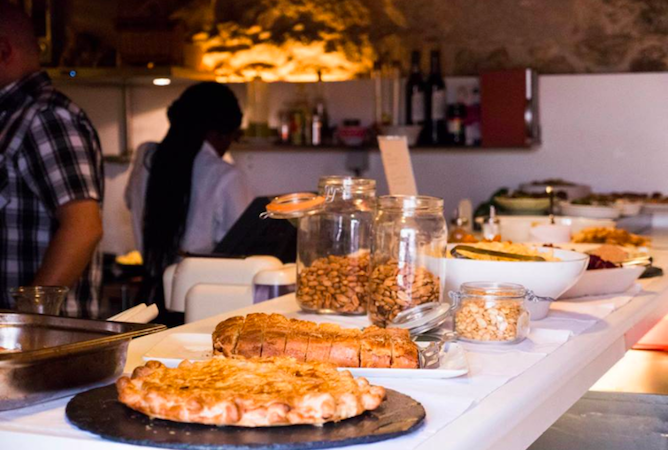 The first one consists of a croissant, rustic bread, ham & cheese, butter & jam, yogurt with granola, orange juice, filtered coffee, cappuccino, velhotes (Gaia’s traditional sweet bread) or a pastel de nata and an expresso (€12). 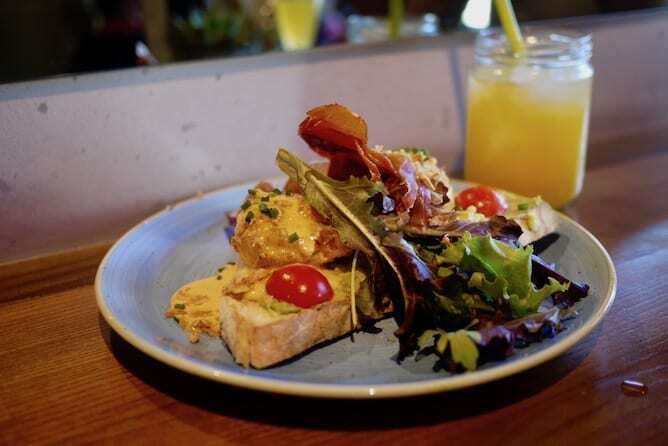 Option two is the same but with scrambled eggs, spinach, bacon and avocado toast (€15.5). 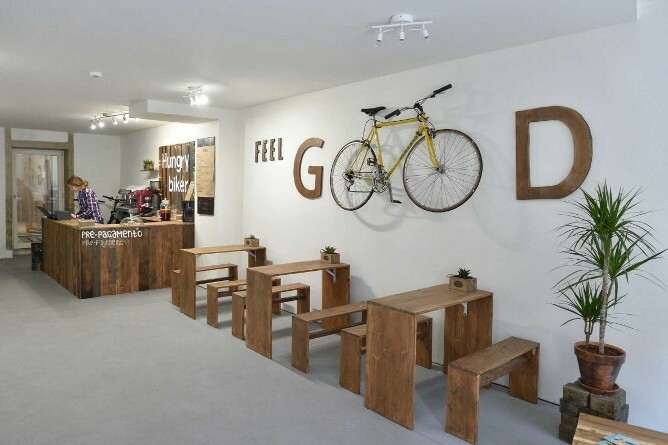 Besides the lovely interior design, 7g roaster is great for coffee lovers who want to try single origin coffees. It’s also a great place for brunch in Porto for those who like to share their food since the servings are quite generous. How to get there: simply take an UBER or the cable car from the top of Dom Luís I bridge. Having been featured as a bar/cultural center in our article on the nightlife in downtown Porto, its versatility never ceases to amaze. In fact, brunch in Porto wouldn’t be the same without this mythical place. 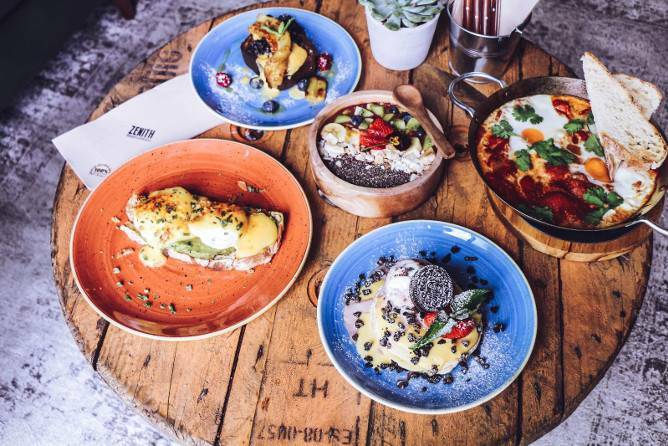 Enjoy their “Vicious Brunch” in the most urban setting of the city of Porto, from their set menus such as the “Brunch for 2” (30€ / 2 Pax), that include bread, eggs, candied tomato, quesadillas, BLT, salad, granola and yoghurt, fruit salad, pancakes and chocolate mousse; “Brunch for One”(14,5€ / person), “Mini Brunch” (9,5€/ person) or “A la Carte” which include the aforementioned in different amounts. Located nearby Santa Catarina street, the main shopping street of Porto, it is an excellent choice to start your sightseeing day in the city. How to get there: Bolhão metro station is a 6min walking distance. 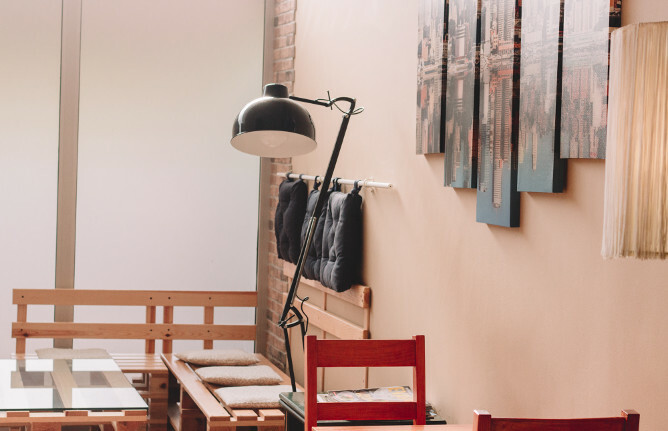 We love so much the boutique hotel ROSA ET AL that we’ve already mentioned it in one of our articles about where to stay in Porto. In fact, ROSA ET AL is not only one of the loveliest places in the city but also one that provides you with one of the best brunch in Porto. 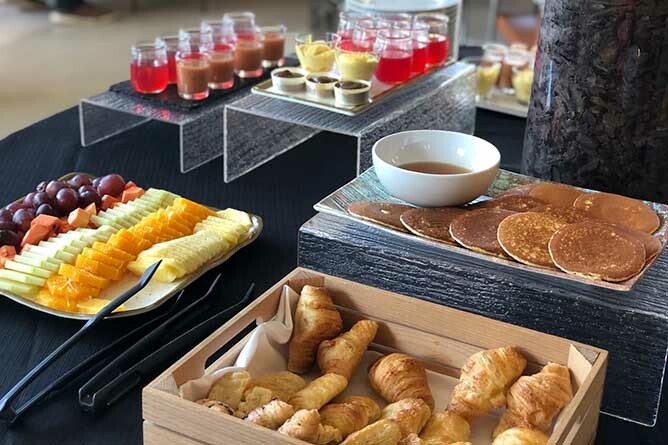 It has several brunch options to choose à la carte, but usually we simply choose the brunch tasting menu, that includes three different dishes, for 20€ / person. 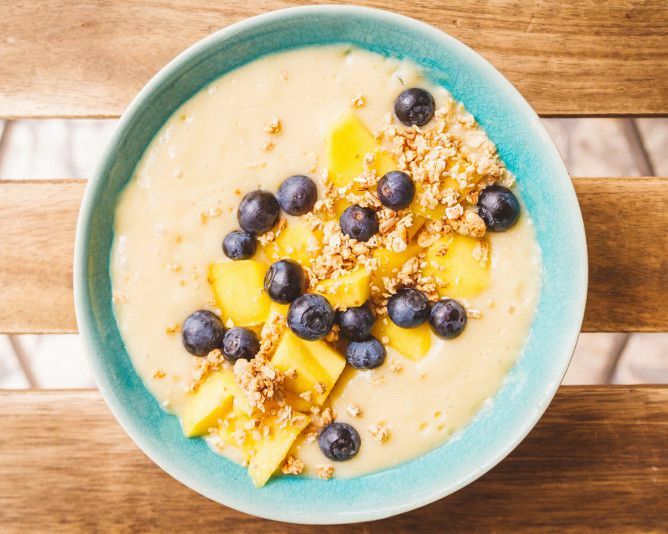 If you are an oat porridge lover then definitely try ROSA ET AL’s, it is to die for. This is a very popular brunch in Porto so we recommend you to book it in advance – you’ll surely won’t get any lucky by simply stopping by! How to get there: Lapa metro station is a 13min walking distance. 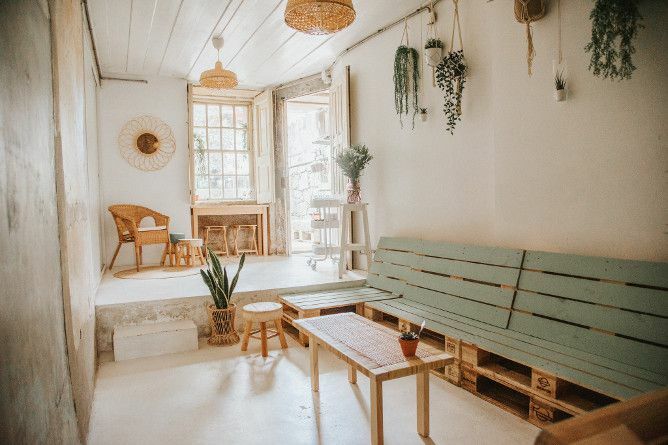 For those who are looking for a weekend brunch in Porto, head out to The Happy Nest where you’ll be kindly greeted by French owners Léa and Capucine, who fell in love with our city and decided to move here. 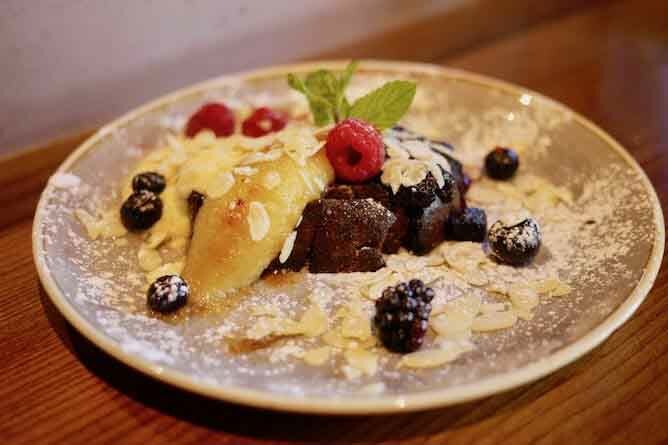 Brunch is served on Saturdays and Sundays between 10am and 3pm. 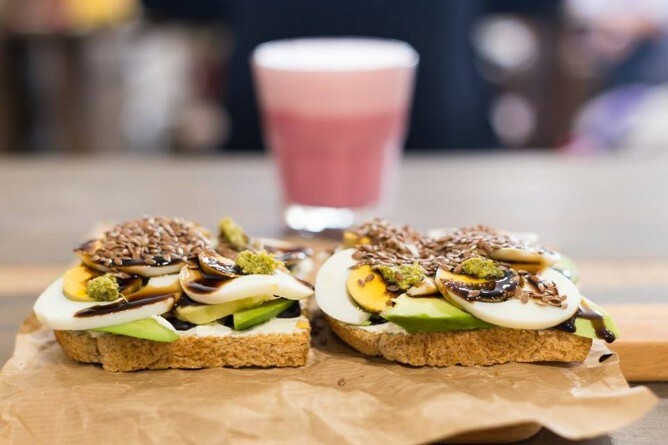 It includes a hot drink (espresso, decaf, macchiato, Americano, cappuccino or tea), a cold drink (fresh orange juice or lemonade), croissant (plain, with jam or Nutella), avocado toast with cherry tomatoes & feta cheese, a yogurt bowl with granola & fruits and an American cookie (€13.5). Many times, The Happy Nest hosts events and workshops that are related to creativity and mindfulness. The price of brunch is included when participating in these activities — what a great way to spend the weekend! Brunch at The Happy Nest requires a reservation (contact them via Facebook chat). How to get there: the subway station 24 Agosto is 5min walking distance. 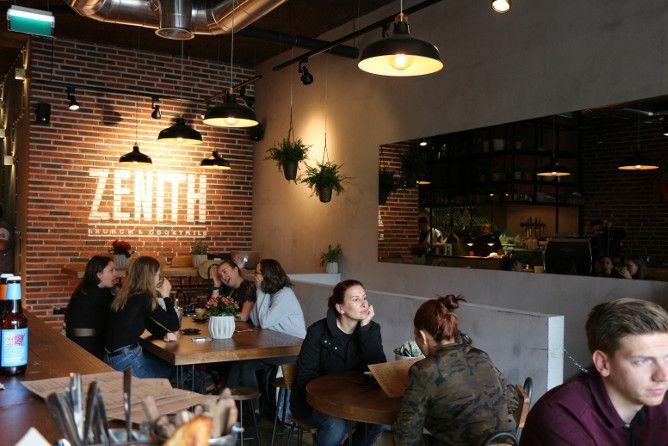 Having started off with the curious concept of serving signature sandwiches, devised by several nationally renowned chefs, the Soundich café wasn’t indifferent to the dawn of brunch in Porto! Right in the middle of Parque da Cidade (i.e. City Park), its location is certainly an element to account for. 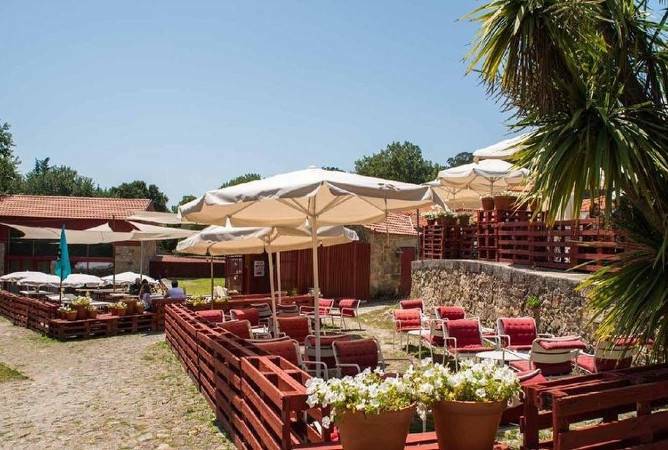 Having a nap on the grass, feeding the ducks, enjoying a magnificent brunch and heading off to the beach is now possible within a 500 meters radius. 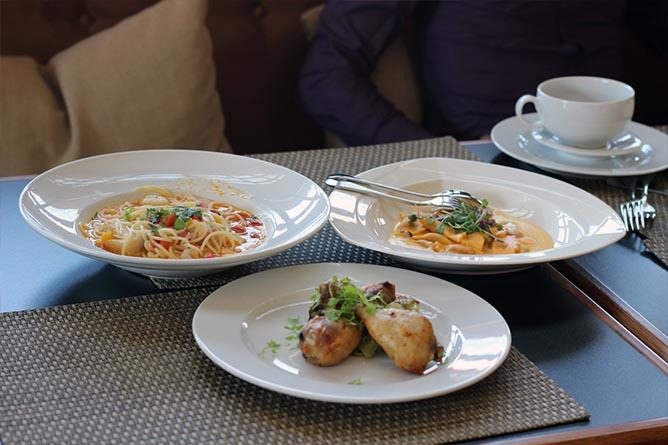 Offering an extensive list of options, its brunch ranges from the most classic bread, fruit or yogurt to the more substantial quiche, couscous, cheeses platter, sautéed potato or grilled mushrooms. Needless to say, it always comes with a side of the smoothest tunes and the freshest air. How to get there: Fastest way to get there is to take an Uber/Taxi. 1st option (€7.5): lemonade, coffee, 2 toasts with eggs, croissant with jam. 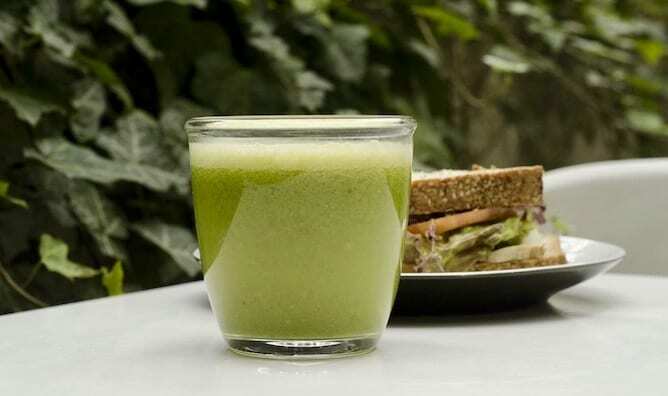 2nd option (€7.50): Juice, coffee, 2 toasts with eggs, salad and sweet crepe with jam. 3rd option (€12.5): Juice, coffee or cappuccino, 2 toasts with eggs, salad, savory crepe with ham, cheese, eggs, salad, 6 pancakes with 2 toppings. 4th option (€9): omelet, mini Caprese salad, ham, 4 mini pancakes, butter, maple syrup or honey. Fifth option (€4.50): 2 toasts with eggs, tomato, ham and cheese. 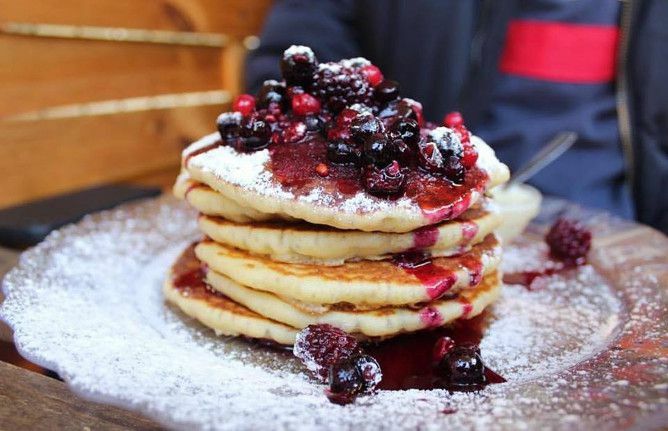 Do your growling stomach a favor and try their fluffy pancakes. They’re tasty, beautifully served and not outrageously overpriced (as in many other places in Downtown Porto!). How to get there: the subway station Lapa is 5min walking distance. 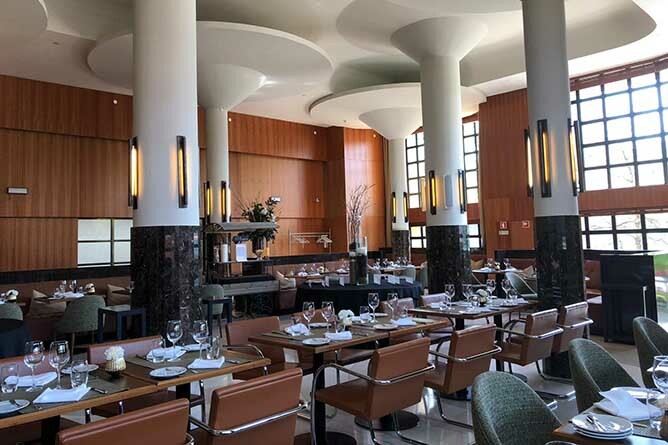 Since we know our readers might be strict followers, or maybe just appreciators, of a non-meat based diet, we would like to invite you to have your brunch in the “cathedral” of all things vegetarian, vegan and gluten-free of Porto. Quintal Bioshop is quite a discrete place, and not the easiest one to find, but it will be very worth your time. In a very cosy atmosphere, in its back terrace, choose between its original sandwiches and salads, gluten-free cakes and juices of the day. Everything homemade – it’s good “clean” food at a great value! The service is impeccable, so whatever the “do”s or “don’t”s of your diet, don’t hesitate to ask because the staff will be more than happy to go through the menu with you. We just hope you’re not allergic to cats, because you might be greeted at the entrance by the feline host of Quintal Bioshop. How to get there: from Casa da Música metro station, take bus 303, 501 or 601 until Hosp. Sto. António. The restaurant is a 5min walking distance. 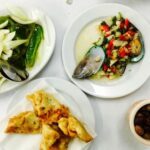 The Hungry Biker checks all the points of everything we want in brunches in Porto: delicious food made with fresh ingredients, generous portion sizes and a lovely interior to sit down and hang out with friends. You can’t go wrong with their classic brunch which consists of eggs, beans, ham, salad, cheese, toast with jam & butter, yogurt with fruit, honey & coconut, espresso, latte or tea (€9.50). Another popular option on the brunch menu is the Royal Brunch. 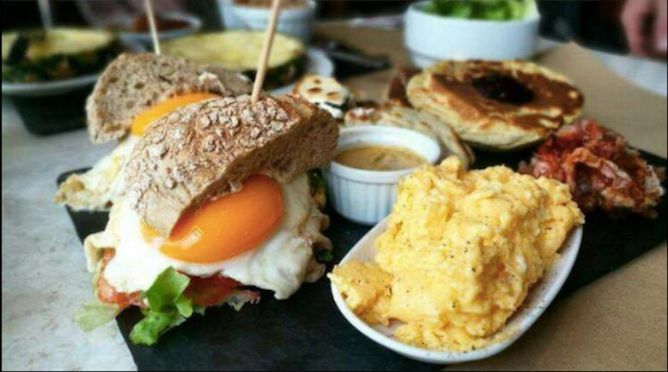 It comes with a sweet bread from the Azores islands, eggs with bacon, salad with buckwheat, toast with butter, yogurt with fruit, honey & coconut, Americano, latté or tea (€11.95). They also have other delicious things on their regular menu like waffles. They are made in-house and you can order them salty or sweet. The only downside is, this is a small café, so if you get there late for brunch, you might have to wait a bit. Other than that, we highly recommend visiting The Hungry Biker because it’s a good value for the money :). 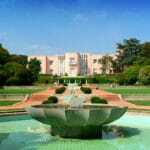 How to get there: the train/subway station São Bento is 10min walking distance. “A brunch without cocktails is really just a late breakfast”. Nobody knows for sure the author of this famous quote, but it could very well have been one of the owners of this bar (or one of us at Portoalities, really :P). 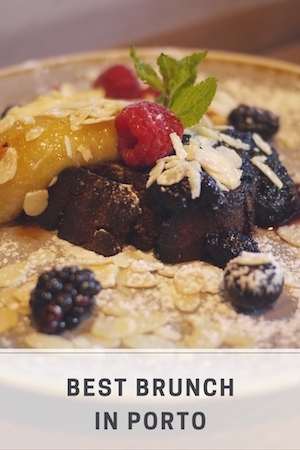 Its menu has to be one of the most stunning varieties of food and drinks of brunch in Porto. Their classic eggs Benedict (in this case served with crunchy prosciutto) are one of the highlights of the menu, along with the French toasts and the banana bread. However, the shiny diamonds of their kitchen would have to be the Smoothie Bowls – strawberry, acai, etc. – and the Shakshukas – Israeli eggs and tofu stew. This ultimate brunch in Porto wouldn’t be complete without Zenith’s cocktails: caipirinhas, Gins, mojitos, Sangria, mimosas… you name it. Perfect not only for a lazy day, for that morning after that night out. You know what they say, there’s no better remedy to a dog bite than the hair of the dog that bit you! How to get there: Aliados metro station is an 8min walking distance. Time for the crème de la crème. 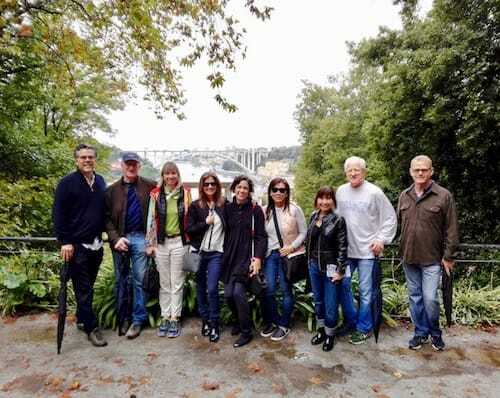 What a better way to spend your early Sunday afternoon than at the most scenic and exclusive place for brunch in Porto? 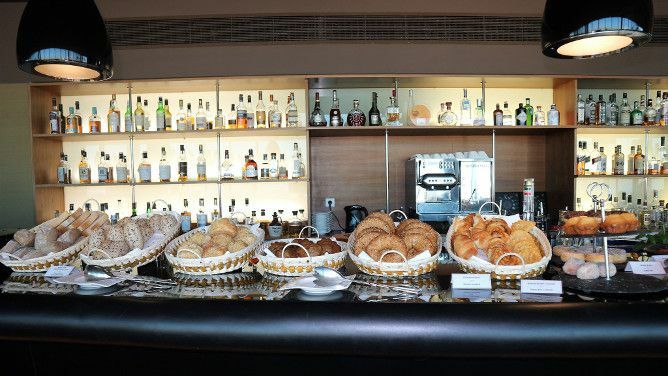 With a luxurious buffet of every item you would expect to find in a brunch menu, plus a selection of skillfully crafted takes on the most traditional Portuguese cuisine, you wouldn’t need any other reason to schedule the VIP Lounge as your choice for brunch in Porto. In fact, the VIP Lounge takes the literal concept of brunch to the table. 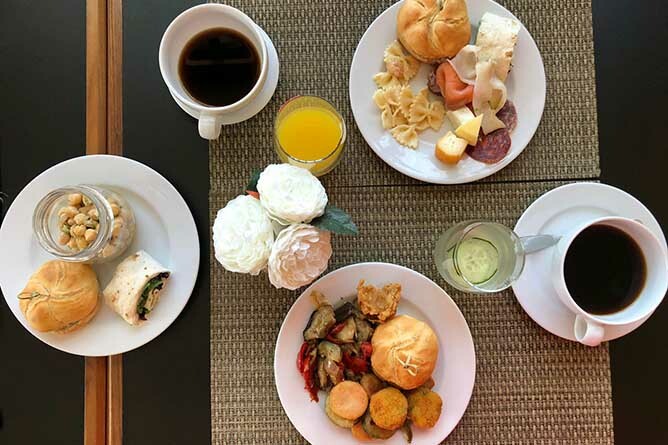 You can find a wide selection of items that are commonly find in breakfast (such as pancakes, granola, delicious cakes,…), followed by a proper warm lunch (meat, fish or vegetarian meals are available), and a desserts’ buffet. 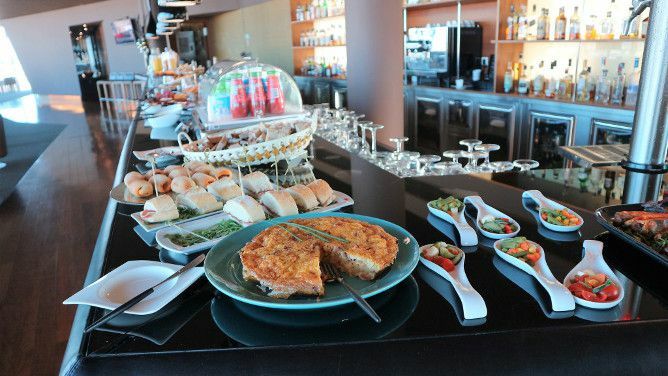 The brunch menu costs 30€ / person (children from 6 – 13 have 50% discount). The setting makes it ideal for that special moment with your better half. 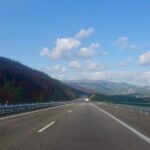 Not only for the high-quality service and five-star catering, but almost as important: the scenery. Bask in the almost endless view of Porto (it really stretches for miles! ), in the champion of rooftop bars. 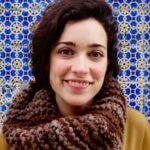 How to get there: Casa da Música metro station is a 12min walking distance. 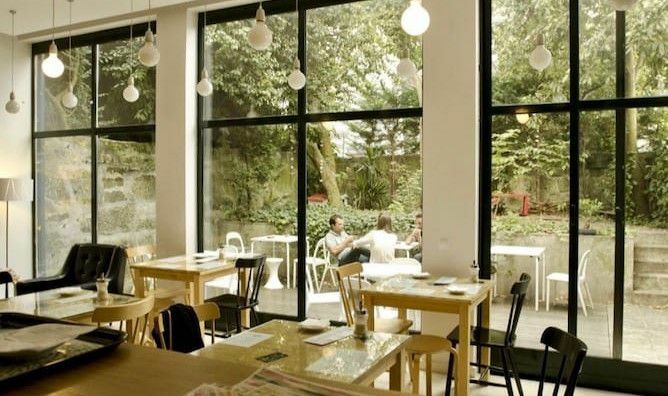 bbGourmet Bolhão is the best place to be when you want to feel the buzz of the city, but still want a comfortable and discrete place to replenish your energies with a proper brunch in Porto, for quite a low price: 15€ / person. Structured as a free buffet plus a main and a drink, get ready for the feast: viennoiseries, hams and cheeses, traditional and puff pastries or even smoked salmon are always available. 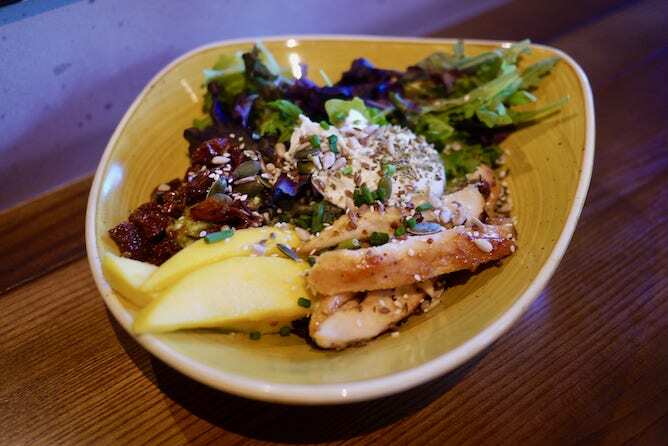 Moreover, you can also order one main from the likes of eggs Benedict (they are so good! ), scrambled eggs with asparagus, omelet with cheese and herbs or red fruits and whipped cream pancakes. 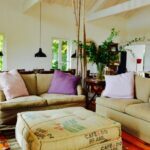 Sit inside on their comfortable sofas or stay out subtly secluded from the surrounding streets. 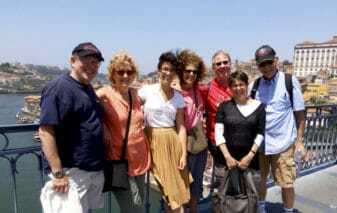 It is located just across the street of the iconic Bolhão market and a small step away from Aliados Avenue. To not be missed! How to get there: Bolhão metro station is a 2min walking distance.